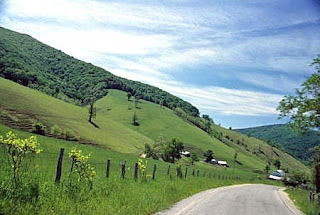 This week, on a road trip from Washington, DC to rural West Virginia for a project interview, my team got to talking about how much we loved the beautiful country we were driving through and how we wish we all ate food straight from the farm every day like our grandparents. We started discussing the best seller The Omnivore's Dilemma by Michael Pollan, a book describing how food is produced in America. Though much of it is pretty frightening, there are some bright spots in the quality of food available, particularly a section where the author describes his week-long stay at Polyface Farm in Virginia. On our road trip we randomly stopped in a small town called Harrisonburg, Virginia, as it was about half-way to our destination. We were feeling the need for a nice treat, so we agreed to seek out a meal better than Denny's or one of the many McDonald's we passed at every exit. We headed for Harrisonburg's downtown area and by chance came upon a restaurant called the Local Chop and Grill House (56 West Gay Street), just a few blocks from James Madison University in a semi-industrial area. We hopped out of the car with the hope of at least getting a sit down meal. And boy were we in for a surprise. The meal was excellent, and to our amazement, on the menu was chicken from Polyface Farms, the very farm that Pollan raves about in his book. We later realized that the farm is only a short distance from the restaurant. And after eating every morsel of the best roasted chicken I have every tasted with asparagus and polenta to die for... I must say I'm convinced that chicken grown thoughtfully with access to lots of good grass (and worms) makes a big difference. The serving I ate tasted moist but dense with protein and full of flavor. I really think I had forgotten what real chicken tastes like. It is definitely worth seeking out food this good. I can't wait for the farmer's markets to open this year!